2014 Honda CR-V 2.2 i-DTEC Black review | What Car? The Honda CR-V Black is a new special edition of the company’s large SUV. Based on SE-T trim, the Black is available with the same three engines (a 153bhp 2.0 petrol, a 118bhp 1.6 diesel and a 148bhp 2.2-litre diesel), but gets more aggressive styling, including a sportier grille, running boards, front and rear skid plates, a big spoiler, tinted windows and 19-inch alloys. Prices start at £28,405, although the 2.2 diesel auto model we’re testing here costs £32,155. 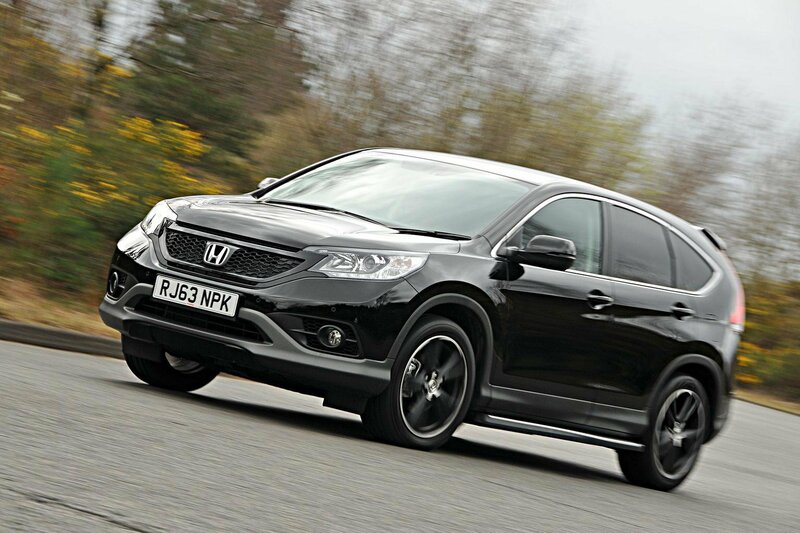 What’s the 2014 Honda CR-V 2.2 i-DTEC Black like to drive? Much the same as any other CR-V, which means the 2.2 litre diesel engine runs out of puff above 4000rpm, but pulls strongly at lower revs. The automatic gearbox is rather antiquated, though. Changes are far from snappy and there are only five gears, so the gaps between them are relatively big. You can also hear the gearbox whining away around town, while the diesel engine sounds gruff at low speeds and growls loudly when you accelerate hard. 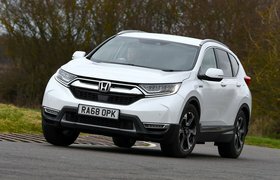 The CR-V isn’t especially refined in other respects, either, because there’s plenty of road noise and you can hear the wind whistling around the door mirrors at motorway speeds. SUV buyers don’t usually expect sporty handling, and that’s a good thing because the Honda's high-sided body leans quite a bit on twisty roads, although it never lurches about uncontrollably. The soft suspension is good at dealing with speed bumps, although the whole car does shimmy around on patched-up road surfaces, and tends to thump over potholes – a trait only made worse by the Black’s standard 19-inch alloys. What’s the 2014 Honda CR-V 2.2 i-DTEC Black like inside? The 'black' theme is confined to the outside of the car, so the interior is a regular CR-V affair. That means there are lots of hard grey plastics, but everything feels very solid; the panel gaps are minuscule and the slick switches operate slickly. There's plenty of head- and legroom in both the front and the back, making the CR-V a spacious five-seater – especially since there's no intrusive transmission tunnel in the back. Access is brilliant, too, thanks to rear doors that open to almost 90 degrees. This, combined with the fact there's very little rear wheelarch intrusion, makes it easy to get small children in and out of the rear seats. The boot is immense at 589 litres with the rear seats in place. It’s well shaped, too, with a shallow lip and surprisingly light tailgate. What's more, if you pull one of the levers mounted on either side of the boot, the corresponding rear seat folds down automatically. There is a slight slope in the boot floor when the seats are down, but loadspace increases to a mammoth 1648 litres. There’s no split-level boot floor, however, and side-storage netting is minimal. The CR-V’s dash looks quite high tech, but it's also quite complicated. There are lots of buttons and switches to find your way around, while the steering wheel adds loads more and the labelling could be clearer. The Black’s standard sat-nav isn’t especially user-friendly, either, mainly due to its unintuitive menu system. As with the regular SE-T model, the Black comes with dual-zone climate control, Bluetooth, front and rear parking sensors, automatic lights and wipers, electric-folding door mirror – plus you also get a reversing camera. You’ll either love or loathe the Black’s styling, but even if you’re in the former camp, it’s hard to recommend. That’s because in our preferred 2.2 diesel auto guise this special edition CR-V will cost you £32,155. Yes, you get lots of standard equipment, but if you have this much money to spend on a large SUV there are much better options – the best of which is the BMW X3 xDrive 20d SE auto. Cheaper versions of the CR-V (particularly the 2.2 diesel auto in SE trim) make a lot more sense, but a a Mazda CX-5 is an even better buy – it's just as practical, better to drive and cheaper to buy and run.